Women were the big reason behind India’s impressive show of India in Asian Games, bringing ten of the team’s 11 medals and also four of the five golds. Incidentally, the medals were brought by India’s small town girls, who fought through poverty and poor facilities to rise to the fore. Preeja’s story is a classic case. Her father died when she was very young and her elder brother had to discontinue his studies after the eight standard and work as a carpenter at Rajakkad in Kerala’s hilly Idukki district. And her mother had to slog in nearby homes on daily wages. 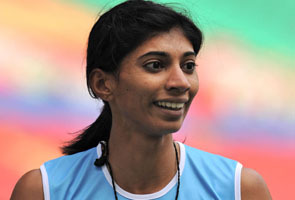 Kavita, who also won the Commonwealth Games bronze, is from a tribal belt near Nashik and took to running only because it could be done barefoot without spending a penny. And Ashwini, who began hurdling only about six months ago and also figured in gold-winning runs in the 4×400 relay teams both in the Delhi Commonwealth Games and at Guangzhou, is from a farming family from a small hamlet in Karnataka’s Udupi District. As the TV sets flashed the news of Ashwini’s Thursday victory, Gensale villagers made a beeline to Shetty’s residence, which is now flooded with water on all its four sides due to incessant rains in the region. The only approach keeping the house from becoming an island is a rattling and half-submerged bridge woven with paddy stalks. Her parents could not watch their daughter’s victory in the CWG event as there was no power at home and the cable network had also been disrupted. They remembered the tough days when the athlete used to practise barefooted at her middle school, about three km from their house. “She used to run barefoot all the way to the school, unmindful of the rough surface. Our financial condition was also not good. All we could manage for her nourishment was vegetables, ganji (rice porridge), and occasionally fish. We wondered from where she got all the energy from,” said Ashwini’s parents. Not many gave them a chance of winning golds in Guangzhou but they proved that they had the will and the power to carry the country forward when the going got tough. This entry was posted in Uncategorized and tagged Ashwini in asian games, Asian games, gold medal in asian games, india in asian games, india's gold medals in asian games, india's success in asian games, indian girls in asian games, inspiring success of rural girls in asian games, Kavita in asian games, medals won by girls in asian games, Preeja in asian games, role of women in asian games, success of indian women in asian games, success story of rural girls in asian games, success story of village girls in asian games. Bookmark the permalink. One Response to Success stories of small town girls in Asian Games.